Text transcribed from two talks by Swami Ranganathananda in Bihar, India. On the spiritual path for householder. The spiritual path for householder, those who do not become monastics requires just as much conentration and practice as for a monk or nun. The swami explains that the householder should be proud of his role in society, for it is the householder who earns money and supports society and the many ashrams. For the first part of the book, he basically scolds Indians (the talk is in India) to start cooperating with each other and come to grips with the ideals of India. 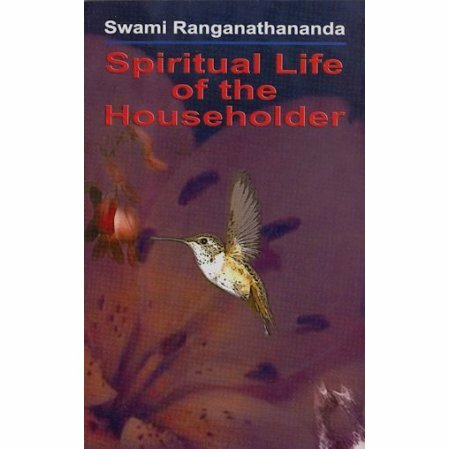 In the second part, he talks about how householders should develop their spiritual life. 99.9% of people are meant to be householders. The swami doesn't mince words in this booklet and he comes across strongly. You will see that this isn't your normal run-of-the-mill book on spiritual practice.